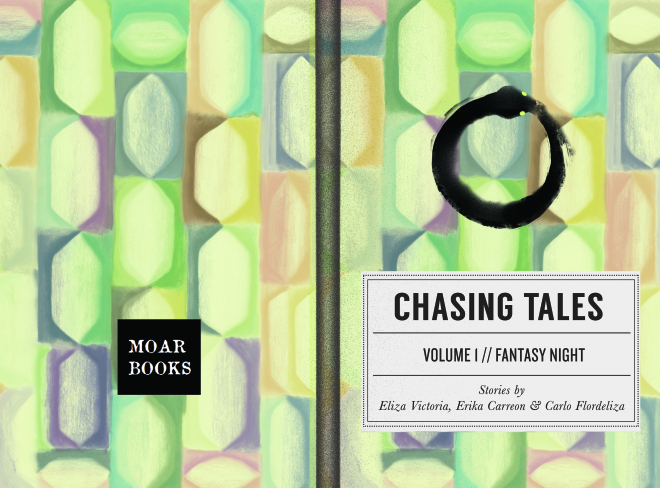 To commemorate our first night of Chasing Tales and to promote the work of our speakers from last August 23rd’s magical night, we’re proud to announce that we are going to be releasing an awesome chapbook featuring work form Eliza Victoria, Erika Carreon and Carlo Flordeliza. This is set to come out on September 20th at BGC’s Art Mart where we’ll be setting up shop that weekend. As per usual, the pre-order price is always cheaper: the pre-order price goes for P265, and the regular price will be announced once the book is available at our bookstore. The volume contains both short stories and excerpts from the upcoming novels of our speakers. You can pre-order by sending us an e-mail at info@moarbooks.net.